Author Betsy Storm profiles fifty Prominent people that live with passion and purpose. She did an insightful job and I’d like to share this information. She profiles inspiring individuals and nonprofits that we at Make It Better Magazine have also featured, such as Gale Gand and the Holocaust Museum. 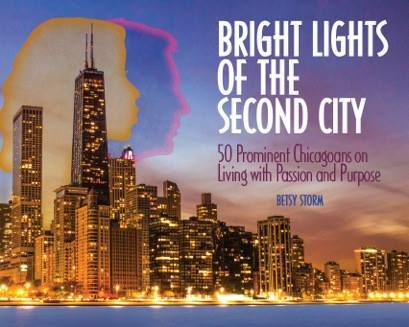 Listen here as she explain the mission of her new book, Bright Lights of the Second City on WGN radio last week. Six of the people profiled in Bright Lights of the Second City live and/or work on the North Shore, including: Capt. James Lovell, Apollo 13 astronaut and Lake Forest Restauranteur; Gale Gand, award-winning pastry chef (lives in Riverwoods); Jim Kenney, co-founder and executive director, Common Ground (works in Deerfield and lives in Lake Forest); T. Gunny Harboe, preservation architect (lives in Northfield); Fritzie Fritzshall, Holocaust survivor and President, Illinois Holocaust Museum & Education Center (Skokie); and Ed Shurna, executive director, Chicago Coalition for the Homeless (lives in Evanston). The book holds one-on-one in depth interviews that describe the life’s, journeys and insights of these prominent Chicagoans. The interesting question that Betsy aims to answer is; Is it possibly to identify the motivations that “enliven these movers and shakers, these midnight-oil burners who pursue their dreams with true grit and then often make their accomplishments look easy?” She doesn’t pose this as a rhetorical question rather gives a resounding “yes” answer. Look to her clever and concise writing to find the answers and glean insights that may change your perspective. It’s always a good day to be inspired by people in your community. Storm’s book makes it easy for all of us. You can buy if now, too, to get your own inspiration.